British pair Jordanne Whiley and Gordon Reid have reached their respective finals at the end-of-season Wheelchair Doubles Masters in California. 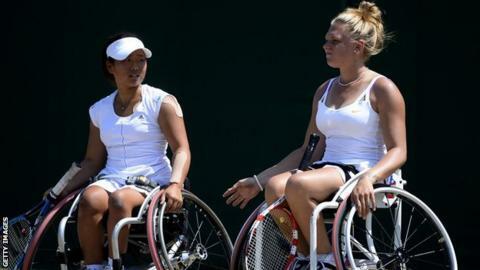 Whiley and Yui Kamiji of Japan reached the women's doubles final after beating Britain's Lucy Shuker and Marjolein Buis of the Netherlands 6-2 6-3. They will play Sabine Ellerbrock of Germany and Kgothatso Montjane of South Africa in Monday's final. Reid and partner Stephane Houdet will play in the men's doubles decider. The top seeds beat the all-Dutch pair of Maikel Scheffers and Ronald Vink 6-2 6-3 in the last four and they will meet French pair Michael Jeremiasz and Nicolas Peifer for the title. "It's so far so good and we've maintained our unbeaten partnership this week with four straight sets wins, so we're confident going into the final and hopefully we can make it four titles from four tournaments," said Reid.